Britain has entered on the civil strife path of secession from the European Union. The consequences of nationalist-inspired secession have always been historically troubling and of uncertain forecast — a self-fulfilling prophecy of understatement, to say the least. The exhibition project is not primarily interested in the pro-or anti- ‘Brexit’ issues but rather in the peculiar fait accompli, as it is, that Britain has undertaken a species of inner emigration. Inner emigration in the past referred to a condition of some German writers, artists and musicians who, although said opposed to Nazism, opted to remain in Germany after 1933. Inner emigration in the present instance is literally the Brexit condition. A different situation, of course, in which the issue of moral dubiety formerly attached to individual choice in 1933 does not apply here. Or does it? No doubt, my contentious terminology adopted from a dark history casts its shadow across the nation, as I intend it to. The point is — for those artists and writers who might be willing to respond to the invitation premise — where will inner emigration take Britain? Somewhere, paradoxical though it may seem, lost in Europe. Separatism is incited by fears of impingement, which are inescapable in our global circumstances of social, cultural and economic inequalities. The greatest impinger of all by dint of cultural stealth or outright inflicted power is America — the far-reaching American Dream — even apparently diminished as it might now appear. ‘Nearly America’ is our own encroaching shoreline. I heard it measured in my native separatist Quebec in the 1960s. 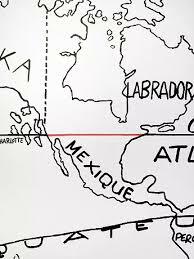 Robert Charlebois ironically complains, ‘an inch and a half from the United States’ on the map, only a thumb’s length away from being culturally and economically squashed to extinction.